One day we see a horse. He’s beautiful and free, with an improbable balance of pride and humility. He seems comfortable with his perfection. Most people can just go on about their business as if nothing has happened. Some of us are never the same. We might be 5 or 45, and something inside swells with love, while common sense shrinks proportionally. You can rest your hand on his strong neck and smell his mane. He might lean close and share his breath, in trade for an exhale of yours. It is almost imperceptible- that feel of the hook, as it is set deeply and permanently. Connection. It’s almost that simple. Then it’s time to ride. One of my clients related her first ride this way: She had waited 50 years, longing and loving horses, knowing exactly how glorious it would feel to be carried by one. Finally, an acquaintance offered her a ride. And in the arena, with a mounting block, and someone holding the horse, she swung her leg over and eased into the saddle. In that perfect moment, she was blindsided with a paralyzing fear. Some of us ride for months before we get frightened, and think twice. Or ride our whole lives, coming off now and then, but don’t give it a thought until we get hurt. Or we get older and eventually gravity just exerts a different sort of pull- if we are honest about mortality. Riders are all somewhere on this continuum- a tightrope between love and fear. Which is perfect because horses have a fear/flight response, and are on the same tightrope themselves. It’s a great place to begin a partnership. Acknowledging vulnerability can be a strength. What if fear isn’t wrong? It shouldn’t have a bad reputation, fear might be another word for respect. No reason to deny it- I think there is a lot of power in calling fear out! Broad daylight has a way of diminishing things that live in shadows. Fear is the first ingredient in courage, so give fear a measured acknowledgement and keep breathing. Then make some room for accomplishment, too. Fear can actually improve riding. I think a bit of self preservation and common sense makes for a good rider, and a measure of fear means that you are aware in the moment, and challenging your horse. A complacent horse might be the most dangerous horse of all. 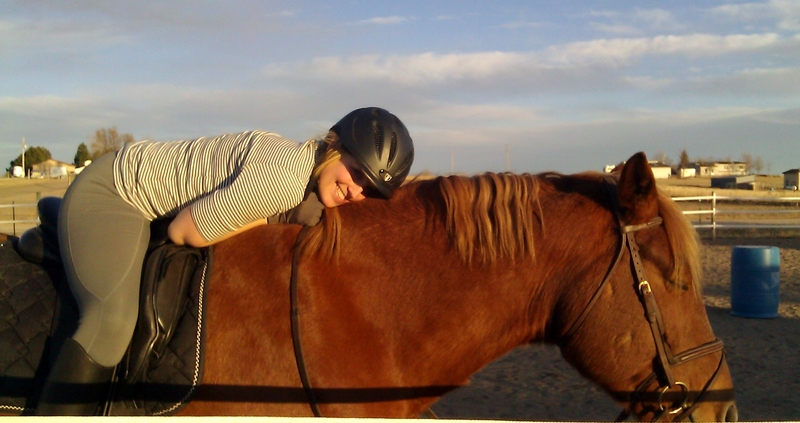 Making friends with fear is a challenge, but it’s still much easier than quitting horses would ever be. So, we ask for forward from our horse, on the ground and in the saddle. We ask for forward of ourselves, to move through mental obstacles and doubt. Horses and humans are a mixed bag of beauty and fear, freedom and resistance. The perfect yin/yang path to confidence. The secret is that our love always has to stay just one inch bigger than our fear. Yup, that’s me! That silly, old fear has cropped up over time. I hop on the horse and whistle a happy tune and then everything is right with the world! The fear is in my head; it comes from the what if’s of riding, not the reality. Oh, I went to a clinic. I think there were 12 of us. I believe that 8 people, maybe more, commented that they were taking the clinic because they were afraid and needed to build up their confidence. Just knowing I was in good company made me feel better – your post does the same! Thanks for commenting, and yes, easier said than done. Keep it up! Thanks for commenting, and yes, sometimes the question is all about what is true. Good for you. It is a fine balance, isnt it? I love the line about asking ourselves for forward…that about sums it up for me!! thanks for the comment, and keep up the forward, both of you! I keep hoping the fear will go away, but I don’t think it ever will completely. But a healthy fear, or respect as you said, is not a bad thing . But it can be manageable and the fear-to-confidence ratio will swing in favor of confidence as we earn and develop trust with our horses, and visa versa. Beautiful post Anna. Like Dreaming said, It helps to know we are in good company. And we can overcome the fear and turn it into a positive. Thanks for dropping by, campers are always welcome.